We're glad to have you in the community! 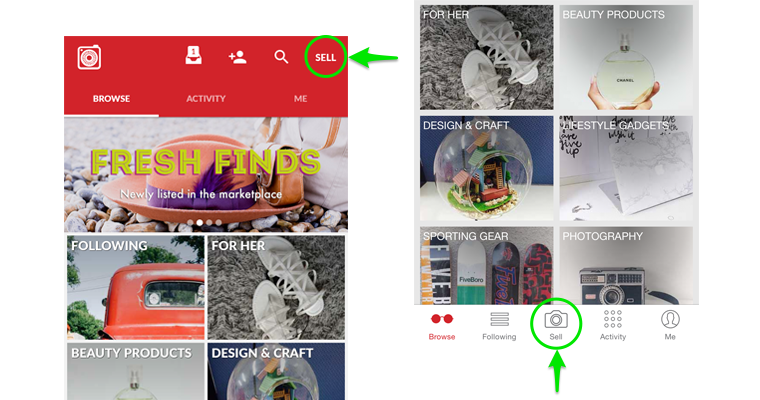 If you're new to Carousell, this handy guide that we've compiled will get you up and running with your first sale (or purchase!) in no time. 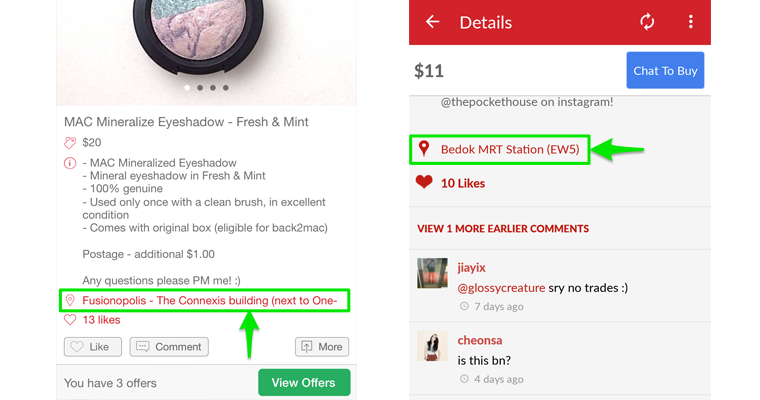 We've also included a couple of tips and tricks to help you get the most out of your Carousell experience. Before you get started, here are our main channels through which you can get updates on Carousell news and events. Follow us to stay in the loop! 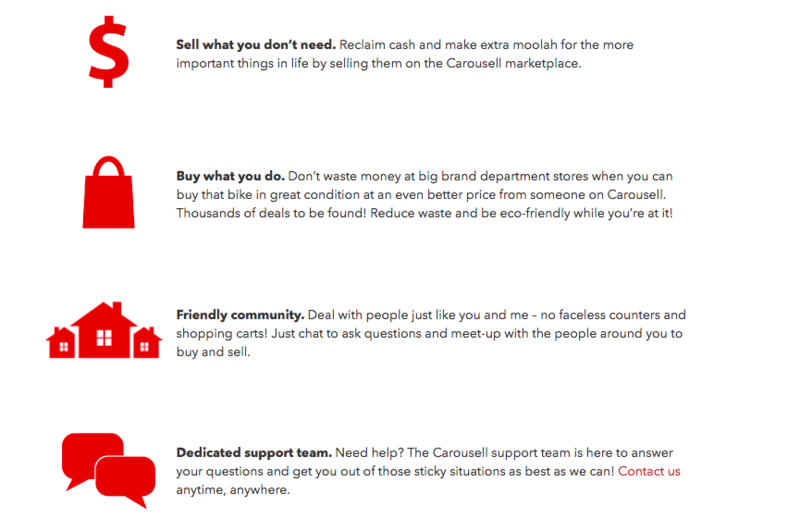 If you need to get in touch with a member of the Carousell team, you can find out how to do so on our Contact Page. For answers to more frequently asked questions, check out our Help Page. Have fun and happy Carouselling! 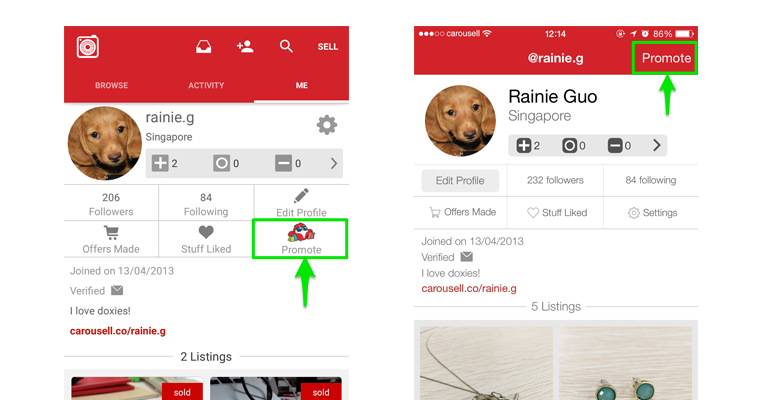 Carousell is currently available as a mobile app for both iOS and Android devices, and it’s completely free! It only takes a couple of minutes to get it all set up. Let’s go! If you’re reading this guide on a mobile phone, just click here to start downloading the Carousell app. 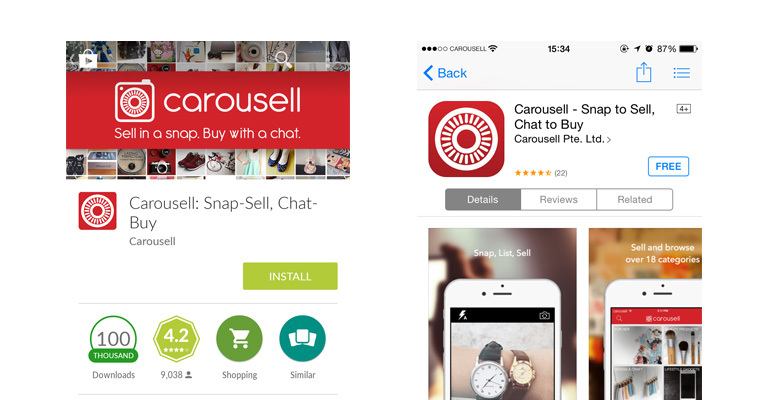 Open the App Store or Google Play Store on your mobile phone and search for “Carousell”, then tap “Install” or “GET”. 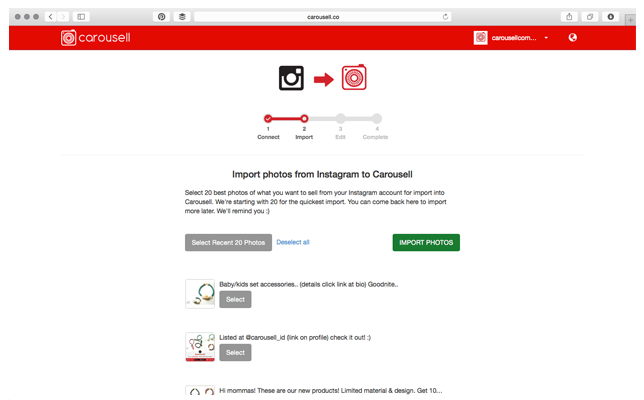 If you’ve already created a Carousell account, you can skip this step! 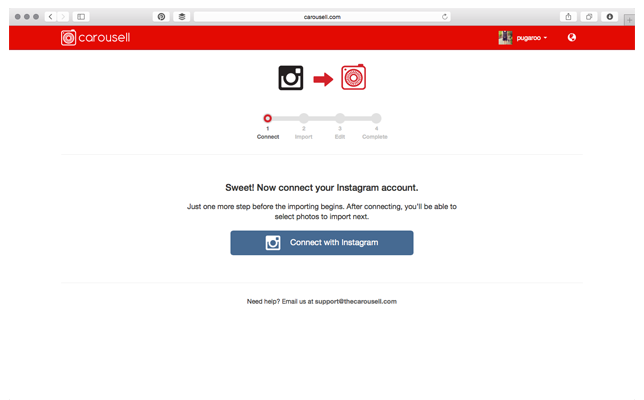 Just login with the username and password you signed up with and you’re good to go! 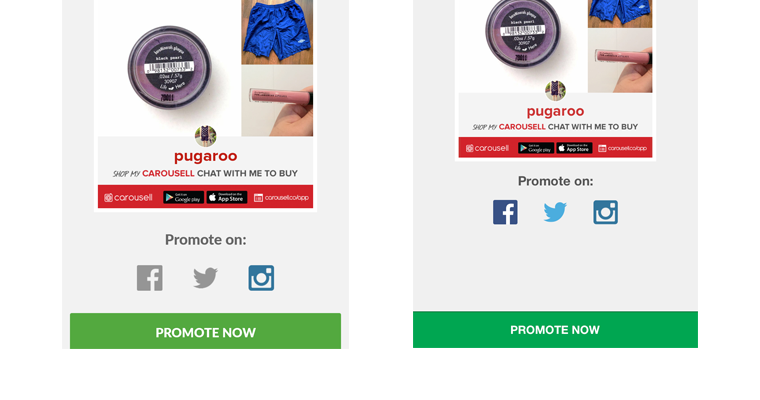 Upon launching the Carousell app for the first time, you will be prompted to either sign-up or login with Facebook, Google+ (Android only) or your email address. You can create your Carousell account by tapping either of these options. 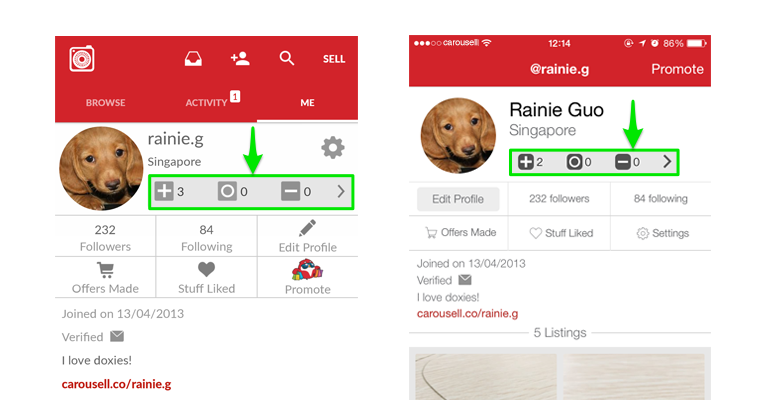 If you have an existing Facebook or Google+ account, you can sign up for Carousell through a 1-tap process. When prompted, just sign-in to your Facebook or Google+ account to authenticate. 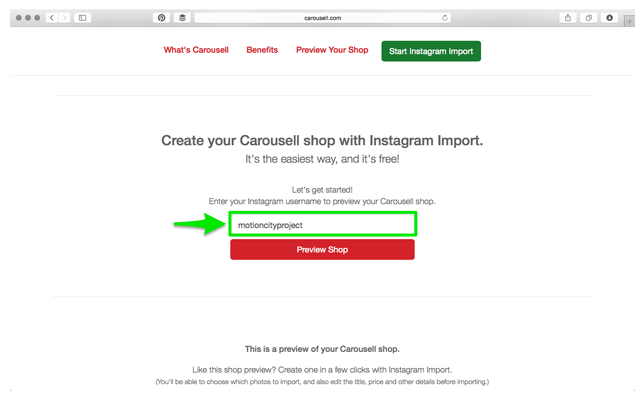 Choosing either of these two options means that your Carousell account will be permanently linked to your Facebook or Google+ email address and cannot be dissociated. If you don’t want this to be the case, sign up with email instead! 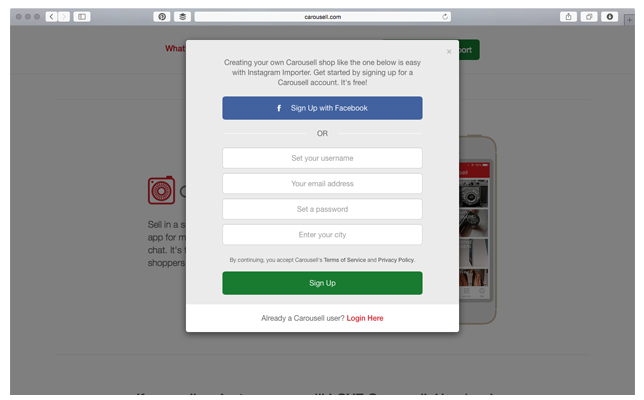 To create a Carousell account using an email address, just tap “Sign up or Log in with Email”. 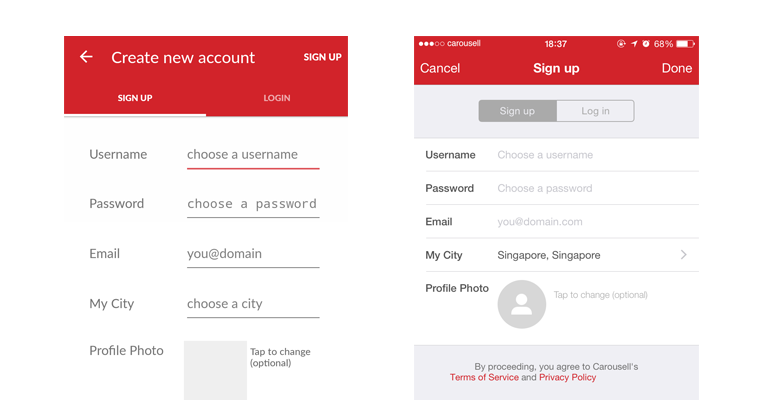 At the sign-up form, you can choose your desired Carousell username and password. After entering the required information into the form, tap “Sign Up”. Your Carousell account will immediately be created and you’ll be logged in with your new account into the Carousell app on your mobile. At this juncture, check your email inbox for the password verification email. Click the link in the email to activate your Carousell account and you’re all ready to start dealing on the marketplace! (Note: You must verify your account in order to sell on Carousell. If you have any issues with this, let us know. 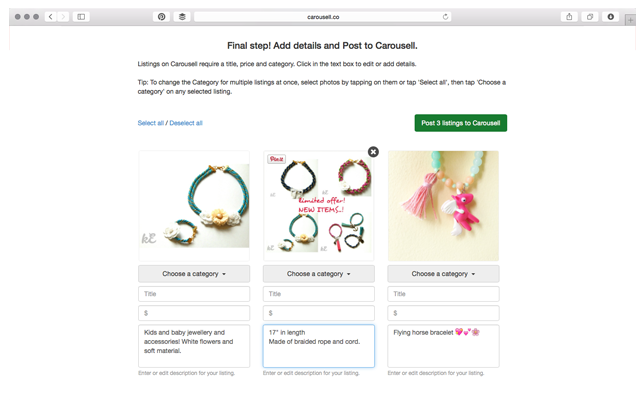 Before we get into listing stuff for sale, why not take a couple of minutes to fill out your Carousell user profile? This lets other community members know a little bit about you and what you’re selling. You can add a picture to your profile as well to add some personality! Got an item you want to sell? 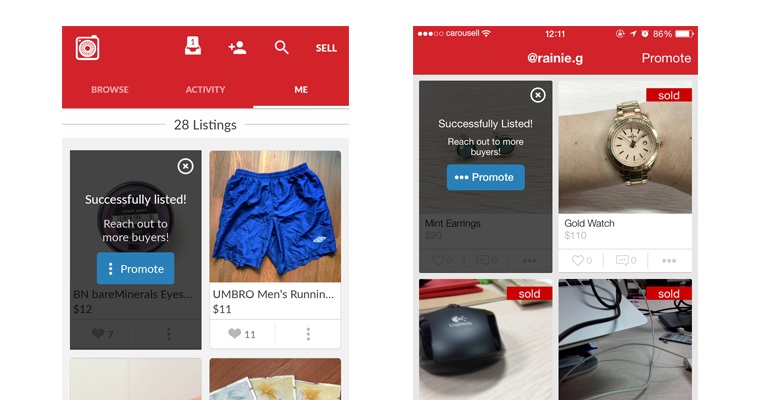 Go grab it and let’s dive right into creating your first Carousell listing! 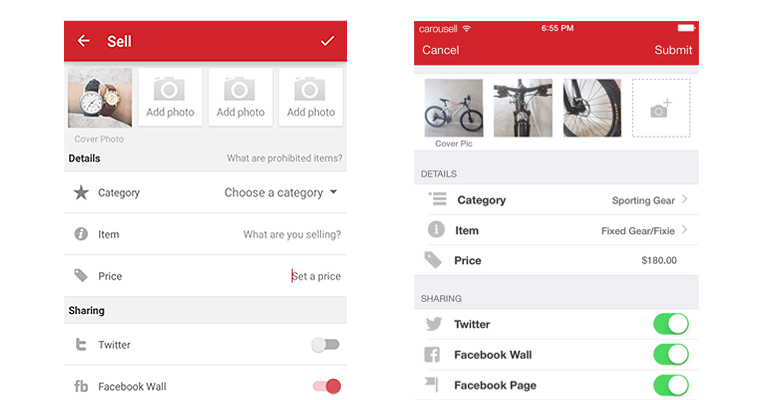 First, make sure that your item is eligible for sale on Carousell. You can list almost all types of items for sale, however there are a couple that we don’t allow to be sold on our marketplace for health, safety, regulatory reasons and simply because such items are not in the spirit of Carousell. 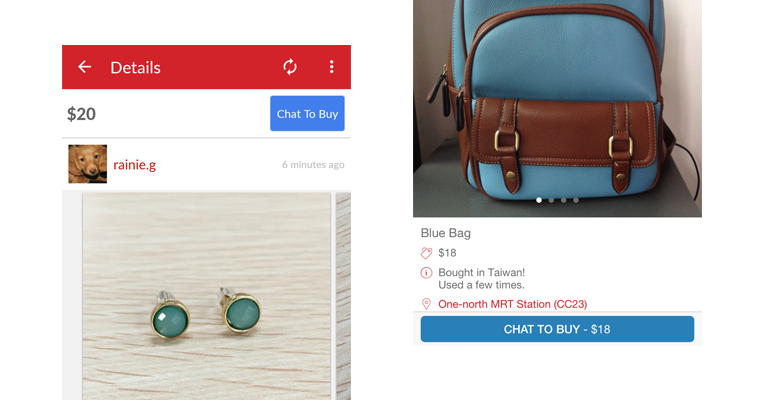 To check whether your item can be sold on Carousell, take a gander over here. Tap the “Sell” button in the top right hand corner of the screen (for Android), or at the bottom of the screen (for iOS) to get started. 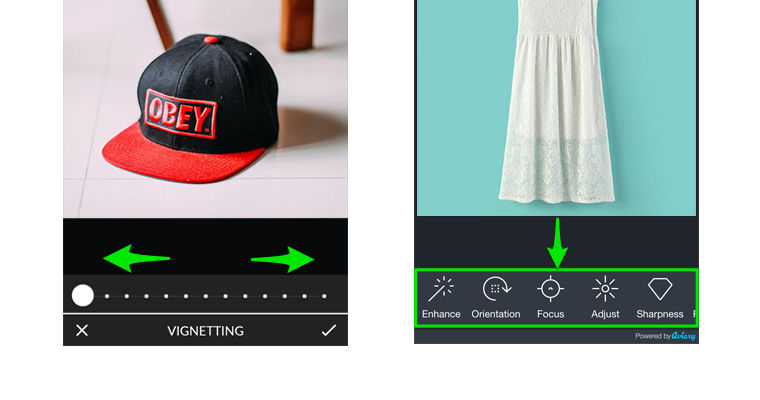 This brings up the in-app camera which you can use to take item photos for your listing. If you want to load photos from your camera roll instead, just tap “Choose an existing photo from gallery” (on Android) or the gallery icon at the bottom right hand corner of the screen (on iOS). You can also edit your photos within the app using Carousell’s nifty photo editor. Adjust the colour tone, brightness, contrast, sharpness or orientation of your photo and even add some cool focus effects! Once you’re finished editing, just tap the green arrow on the top right hand corner of the screen (on Android) or “Done” on (iOS). Up to 4 photos can be added to an item listing, so make full use of these slots! Take photos of your item from various angles and distances to make it look awesome, or highlight to buyers any defects and particular details. All that’s left to do now is to fill in the sell form by choosing a category for your item, entering an item title and item price! If you’d like to add more details about your item, you can do so in the “item description” box under the “item” field. This is optional though, so you can skip it if you want. And… tap “Done”. That’s it! Your item is now listed on the marketplace for sale. 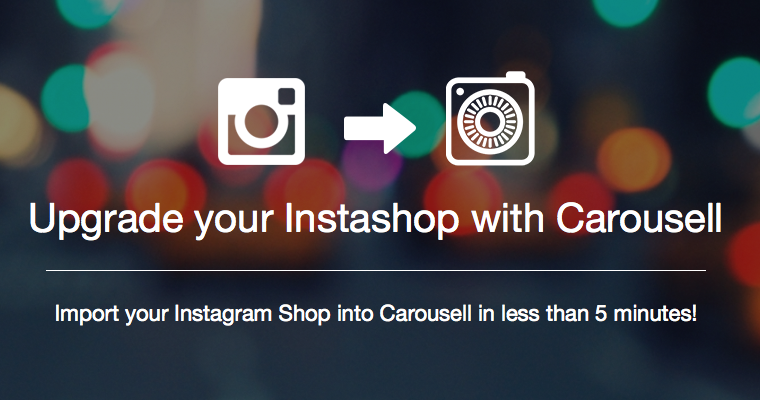 Use this feature only if you want to import existing “for sale” listings from your Instashop to your Carousell store. 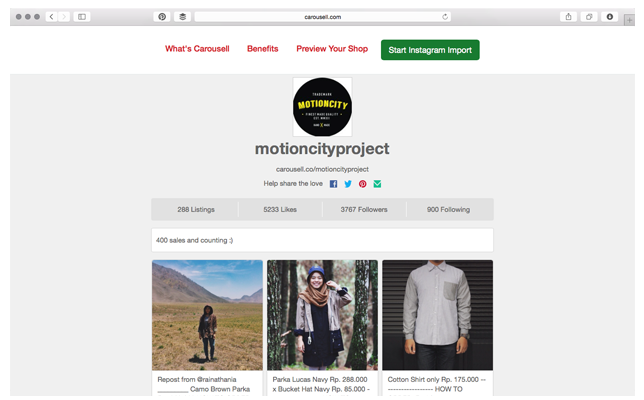 If you don’t use your Instagram account for selling, then skip ahead to the next step! 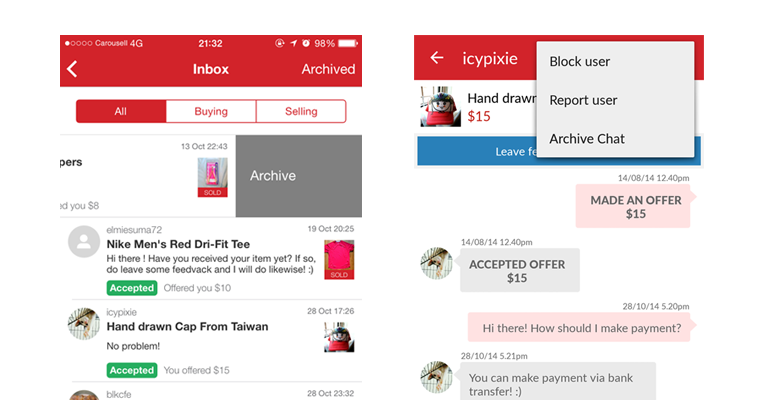 Carousell’s Chat to Buy feature is what makes transactions on the app so simple. 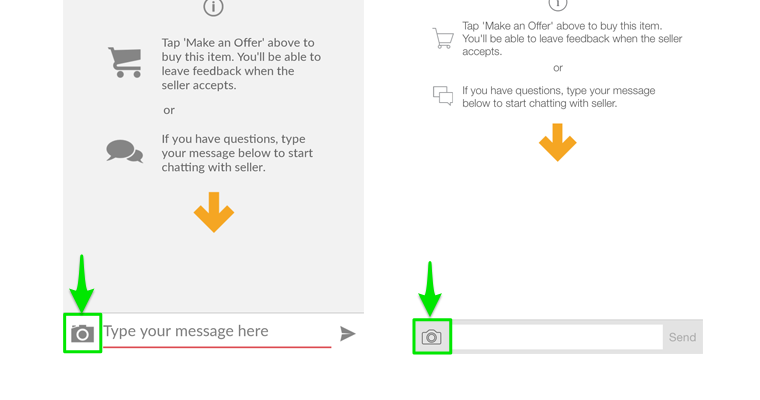 It allows you to private message other users to ask questions about item details, confirm a deal or even send pictures! Chat with other Carousell users on the go without the hassle of opening other messaging apps or your email inbox. Confirm a deal only when you’re ready to so you can buy and sell with confidence. 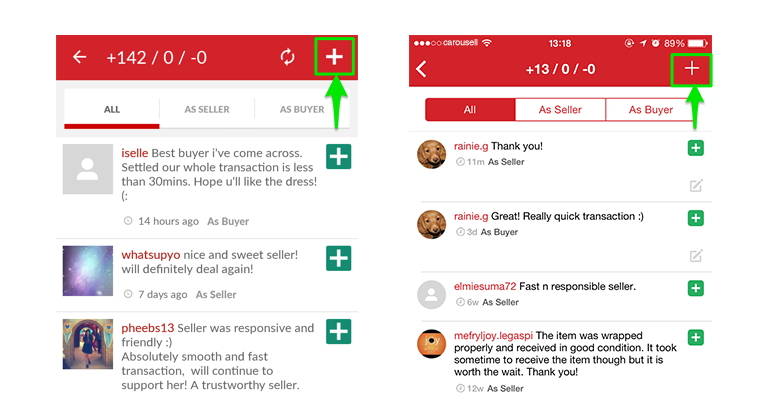 To have a chat with a seller before making an offer, tap into an item listing, then tap “Chat to Buy”. 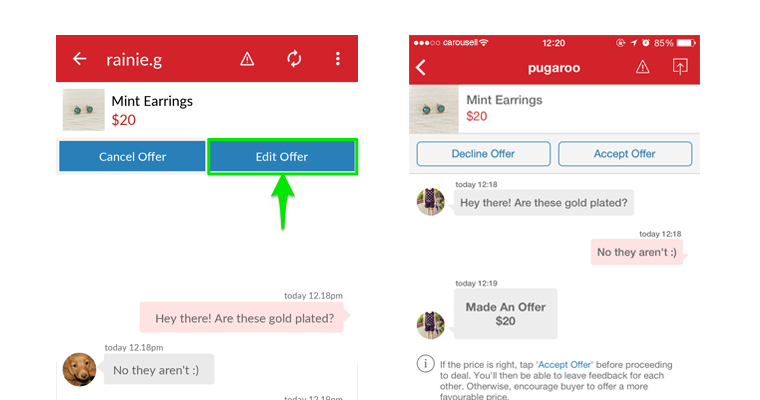 The “Chat to Buy” button can be found at the top right hand corner of the screen on Android, and at the bottom of the screen on iOS. Start typing away, just like in any regular chat! 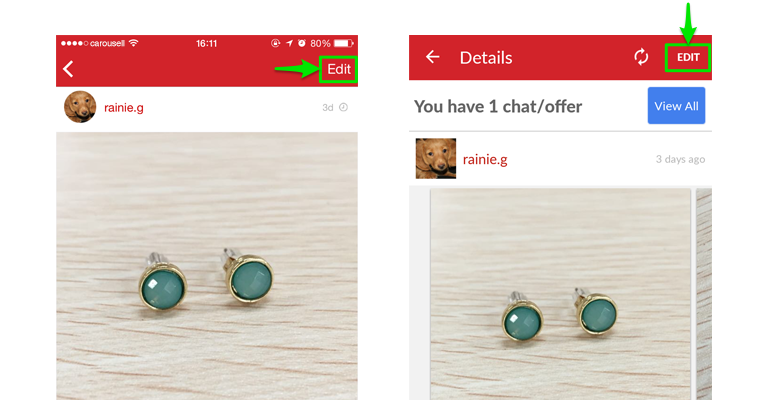 You can also send photos to other Carousell users within a chat by tapping the camera icon at the bottom left hand corner of the screen. 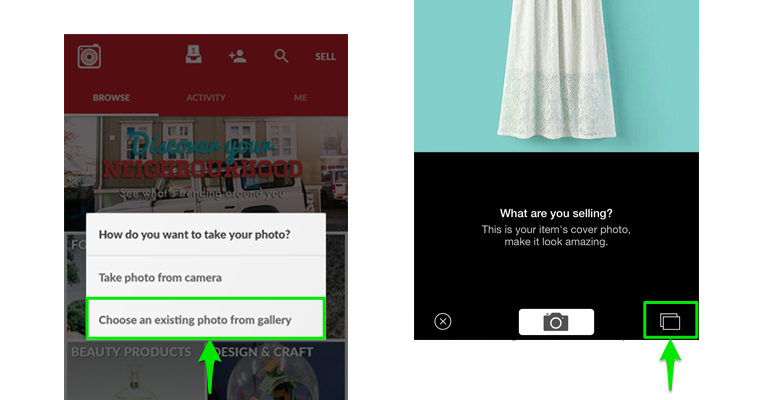 You can choose whether or not to use the in-app camera to take a photo, or send a previously taken photo from your camera roll. On iOS, just tap the bottom right hand corner of the screen when in camera mode to bring up the camera roll. 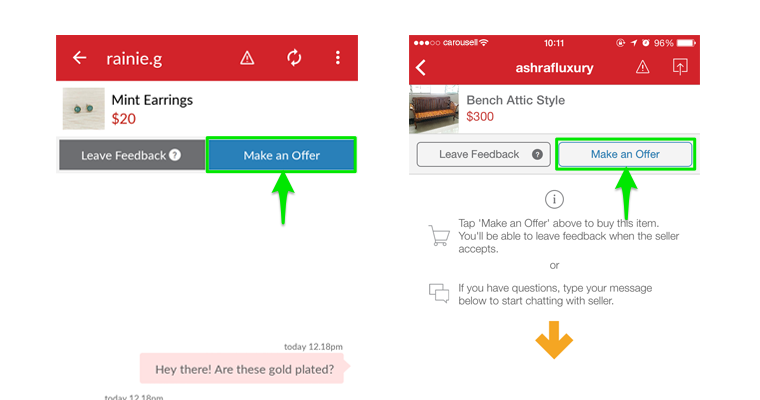 Chats can be accessed at any time in your Carousell inbox. The Inbox can be found by tapping on the “inbox” icon on the main category screen (on Android), or going to “Activity” then tapping on the “inbox” icon on the top right hand corner of the screen. 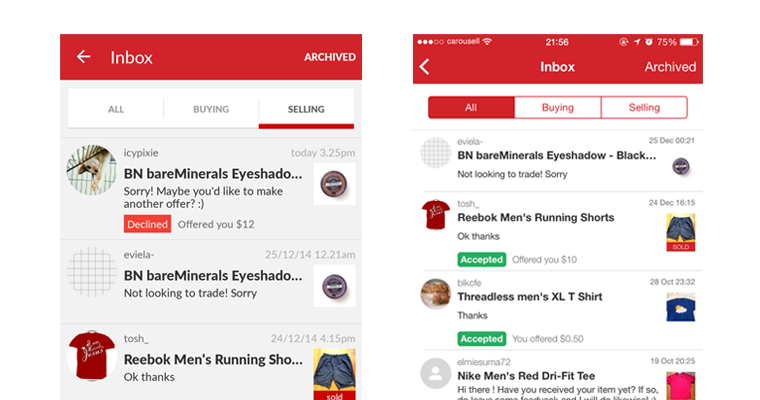 Chats within your inbox are organised according to whether they relate to items being bought or items being sold. Switch between each folder by tapping the bar on the top of the screen. 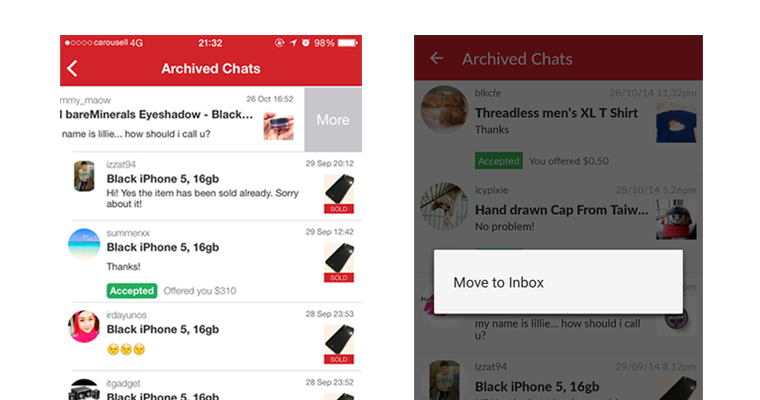 To archive old chats and closed deals, swipe to the left. Chats can also be archived from within the chat screen by tapping the “more” icon at the top right hand corner of the screen, then “Archive Chat”. You can move chats from the Archive back to the Inbox by swiping left, tapping “More” then “Move to Inbox” (on iOS), or with a long tap on the chat (on Android). Chats can also be moved back to the Inbox from within the chat screen by tapping the “more” icon then “Move to Inbox”. 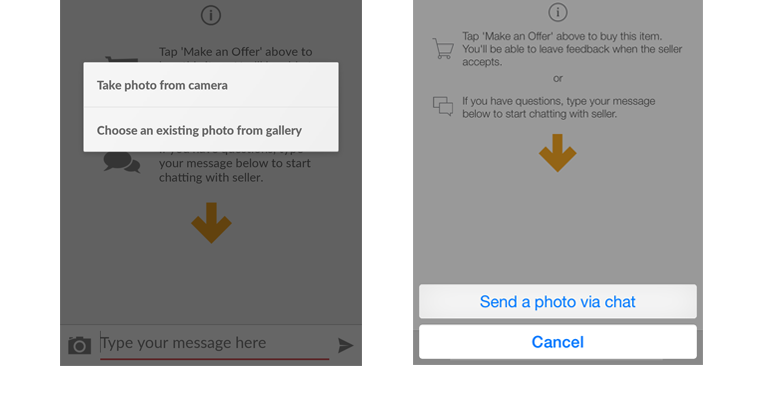 So you’ve already seen how Chat to Buy works – ask a question and get an answer, just like in any regular chat. Simple! Once you’re done chatting and are ready to seal the deal, it’s time to officially Make an Offer for the item. As a buyer, it’s up to you to choose a (reasonable) price to offer! First, go to the chat screen and tap “Make an Offer”. Type in the amount that you want to offer to the seller for the item. Just tap the figure to change the amount, then tap the “tick” icon (on Android) or “Submit” (on iOS) once you’re ready to submit your offer. Be sure about your offer before submitting one! It’s not advisable to back out of a deal unnecessarily or without good reason, so just be nice to your fellow Carousell community members, k? 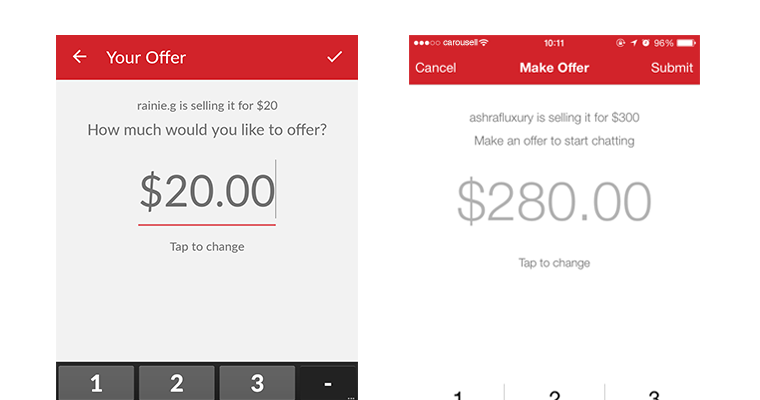 If, after submitting an offer, you need to change your offer price for any reason, tap “Edit Offer” and offer another price. 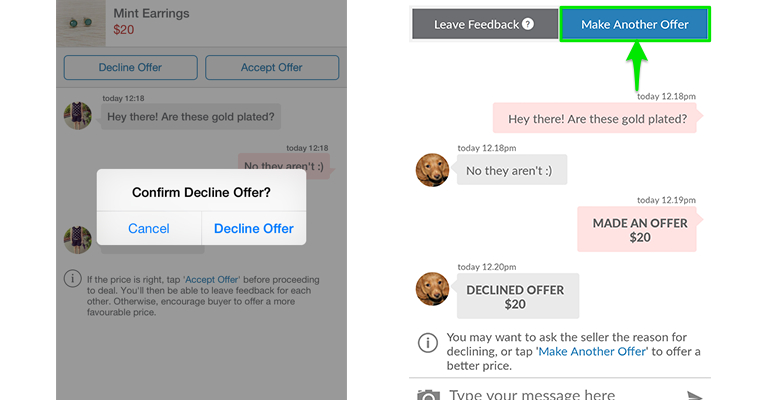 After a buyer’s offer has been made, the seller can decide whether to accept or decline it by tapping either “Decline Offer” or “Accept Offer”. If the price offered is unsatisfactory or the item is unavailable for any reason, you as a seller can decline the offer. Should the deal still be open for negotiation, the buyer can then choose to revise the offer by tapping “Make Another Offer”. A seller can close the deal after declining the offer as well. You as a seller are not obligated to accept further offers if you don’t wish to. 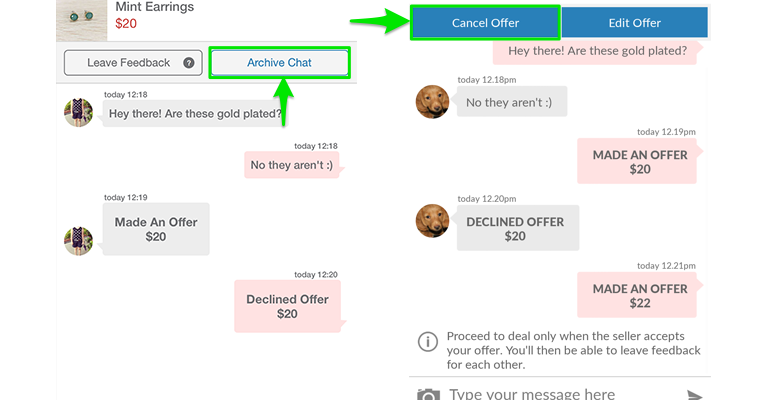 Just communicate your position clearly to your buyer, then tap “Archive Chat” to file away the conversation! As a buyer, you can also cancel your offer if the seller has not responded and you have changed your mind. Just tap “Cancel Offer”. 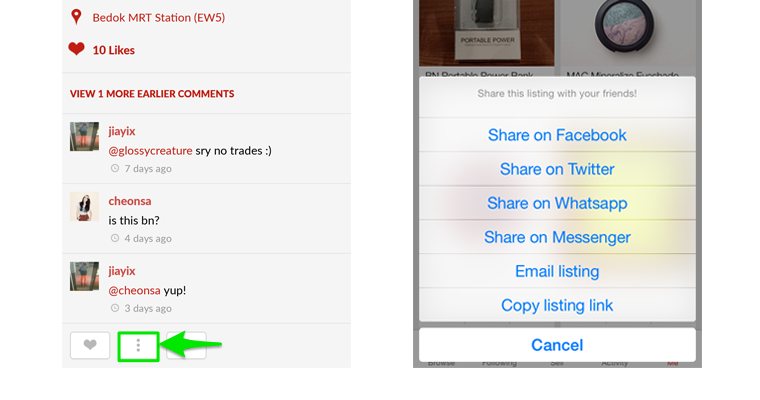 Once you’ve received an acceptable offer from a buyer, just tap “Accept Offer” to indicate your agreement as a seller. Items must be marked as “Sold” after a deal is complete. 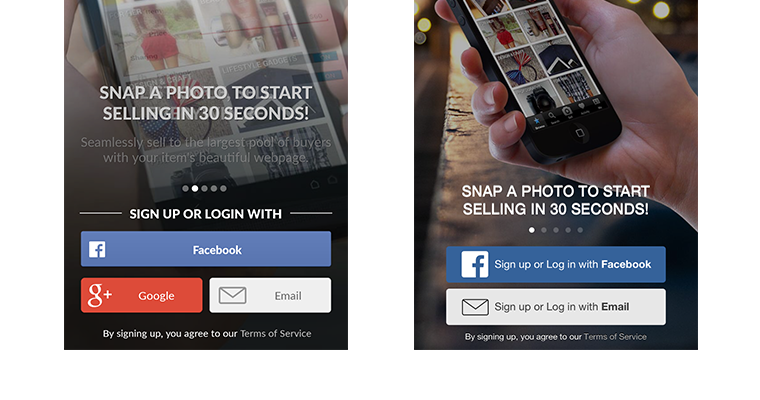 This removes them from the marketplace so you won’t continue to receive offers on them. All items will remain on the marketplace until they have been marked as “Sold”. 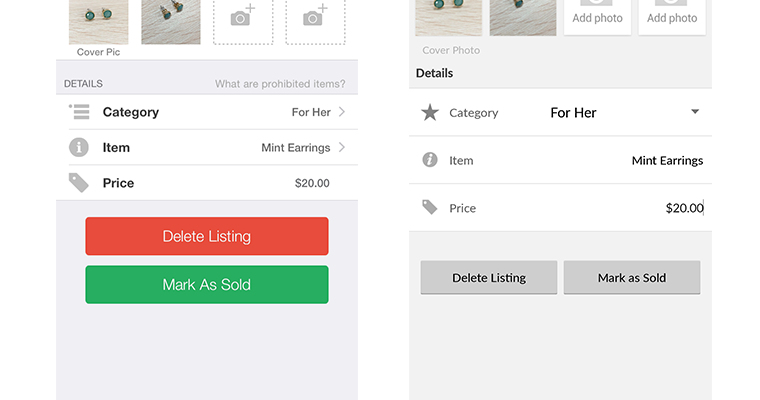 To mark an item as “Sold”, go to your item listing and tap “Edit” on the top right hand corner of the screen. On the next page, scroll to the bottom of the screen then tap “Mark as Sold”. Marking items as “Sold” is irreversible, so only do it when you’re sure you want to stop receiving offers! You can accept multiple offers from more than one user, so if a deal happens to fall through, don’t worry! 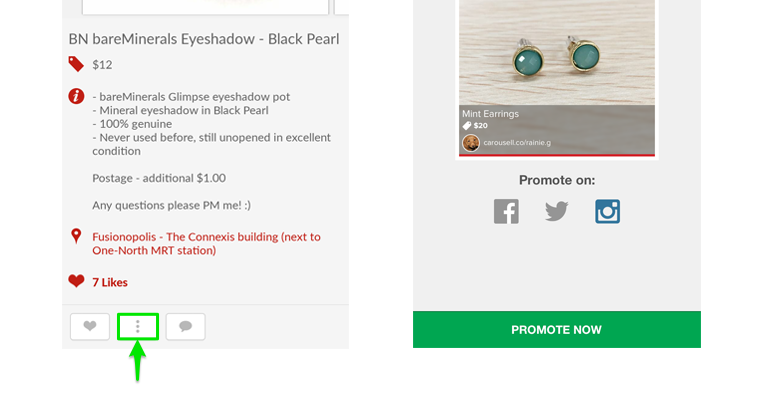 Other users can still see your items and offer you a price for it. Woohoo! A buyer has offered to buy your item and you’ve indicated your acceptance of the deal. Now what? The first thing to do is to discuss with your buyer how payment for the item will be made. Carousell does not have any integrated payment gateways at present, so you are not bound to transact in the app, neither do we charge any transaction fees (or any fees at all, really!). It is up to you and your buyer to come to an agreement on a suitable mode of payment that works for both parties. When deciding on a mode of payment, only use trusted services which are familiar to you, and which you are comfortable with. Avoid money transfer services such as MoneyGram or Western Union as these are commonly used by fraudsters to conduct scams. It is also advisable to ensure that an offer has been made and accepted in Carousell before any payment is made. This ensures that feedback can still be left for a seller or buyer should a deal go awry. If you are a buyer, let the seller know once payment has been made. Make sure to save any transaction or payment receipts as well for record. After payment has been decided, next determine how the item will be delivered to the buyer. Again, this is entirely up to buyer and seller to decide, so choose a mode of shipping both parties are comfortable with! For additional peace of mind, opt for shipping services which are signed-for, eg. Tracked mail or Courier. If you are a seller, be sure to let your buyer know what the shipping costs are upfront so that this can be factored into payment for the item. Always be transparent with costs to avoid any nasty surprises! Also, only ship items AFTER payment has been made. Should there be any mishaps with shipping, eg. the item is lost or delivered to the wrong address, try to work it out amicably with the other party. One way to settle such issues is to agree to split the loss 50/50. Should there be any serious disputes, the Carosuell team is always ready to help, so just let us know how we can help! If you are transacting with a user who is around the same area, or willing to meet-up at a location that is acceptable to you, then this may be the best option! First time Carousell dealers usually feel more assured when dealing through a meet-up as cash and item are exchanged in person. If the item being transacted is of a high value, a meet-up would be advisable as well. If you are a seller and are willing to transact through meet-ups, you can state your preferred meet-up location when listing your item for sale. 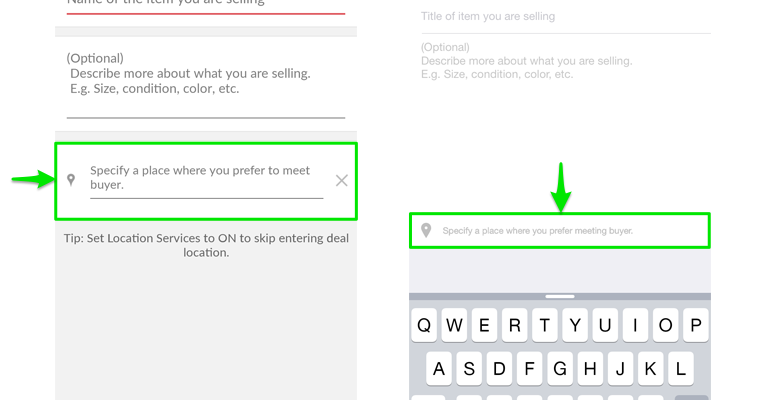 As a buyer, you can see the preferred meet-up location of a seller before you making an offer for an item. Just tap into an item listing and scroll to the bottom. Although most Carousell users are friendly, harmless people, always remember that meeting up with another user you are not familiar with is essentially meeting a stranger! Use common sense when organising such meet-ups to avoid problems and read our tips on how to deal safely on Carousell. 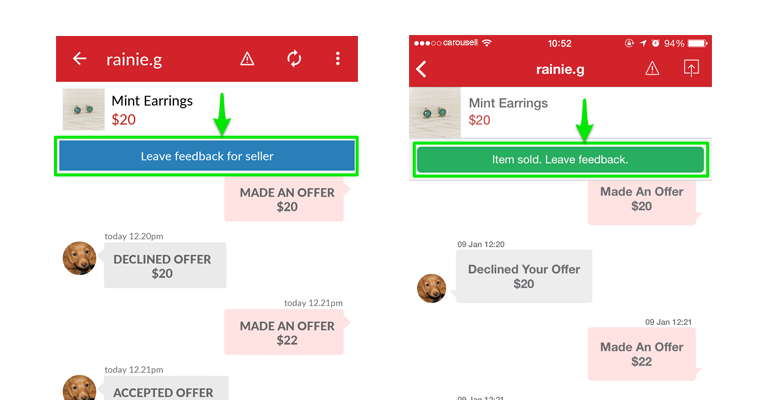 After completing a deal, settling payment, shipping and all that jazz, you can leave feedback for your buyer or seller to let them know how the transaction went for you! Before leaving feedback, ensure that an offer has been made and accepted first. User feedback can only be submitted after this has been done. This ensures that feedback accumulated by a user relates only to legitimate transactions. 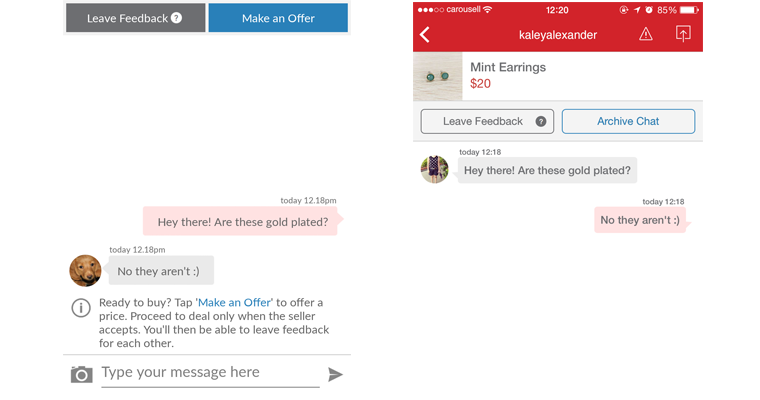 To leave feedback for a user, tap into the Chat screen after a deal is complete. 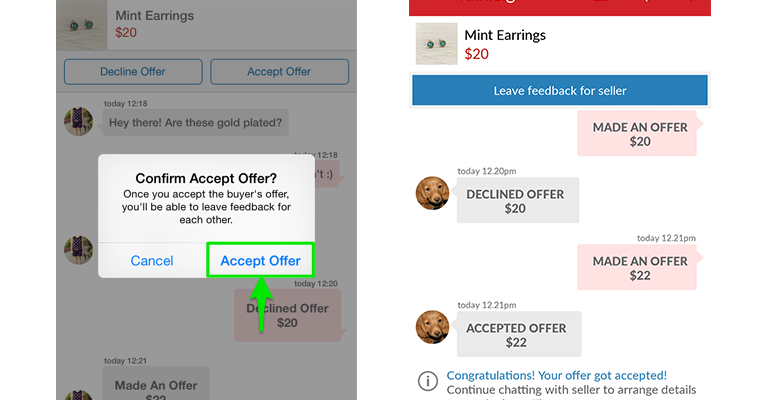 A feedback button at the top of the Chat feed will appear only AFTER an offer is made and accepted. Tap this button to bring up the feedback form. 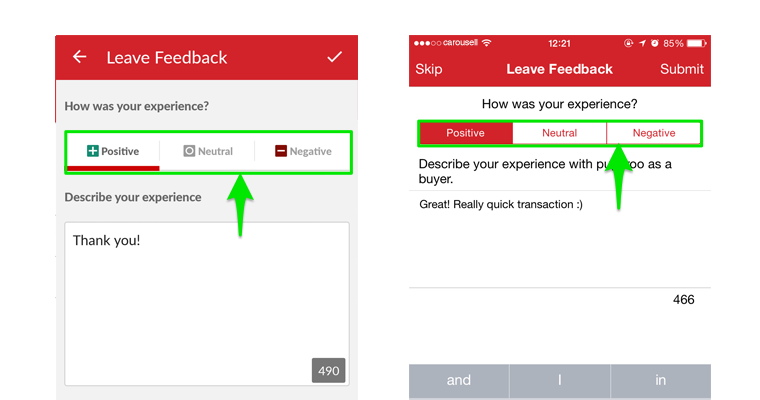 As part of leaving feedback, you can indicate whether your deal experience was “positive”, “neutral” or “negative”. Leave some accompanying comments as well to elaborate on your feedback. Be as objective as possible when leaving feedback and keep any criticism constructive to ensure that the feedback system is kept as helpful as possible for everyone! 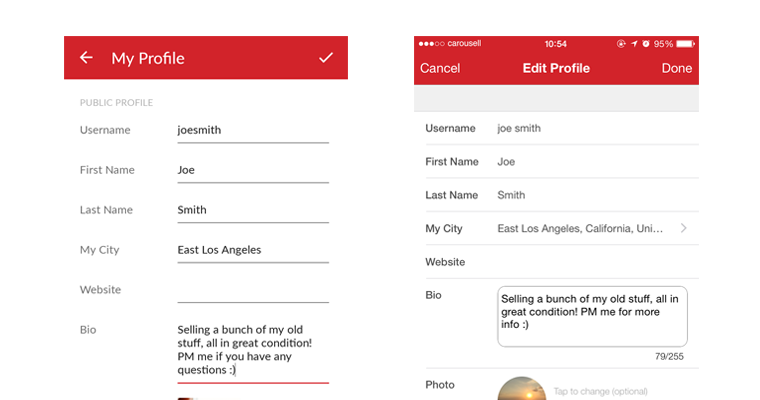 You can also bring up the feedback form from a user’s profile by tapping the Feedback bar. 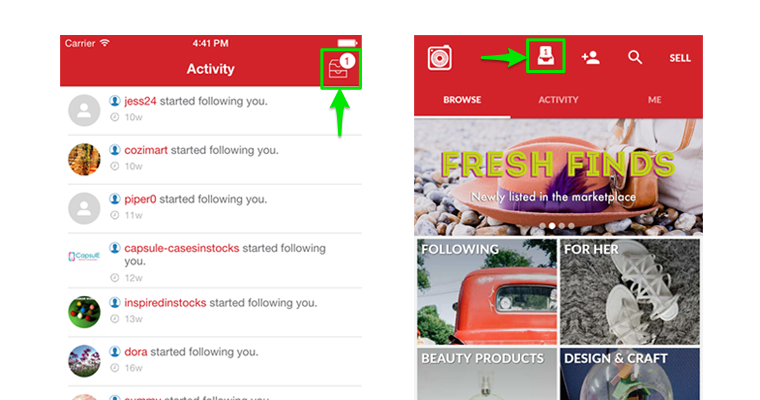 Once on the Feedback page, tap the “+” icon on the top right hand corner of the screen to start leaving feedback for the user. 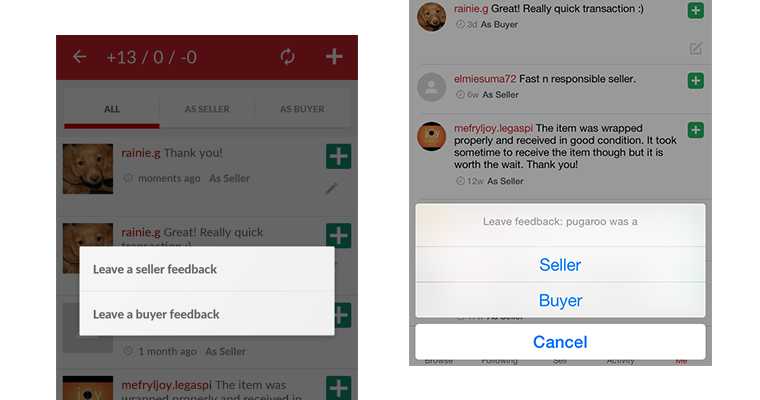 Next, choose whether you are leaving feedback as a buyer or a seller, then start typing! Yay! 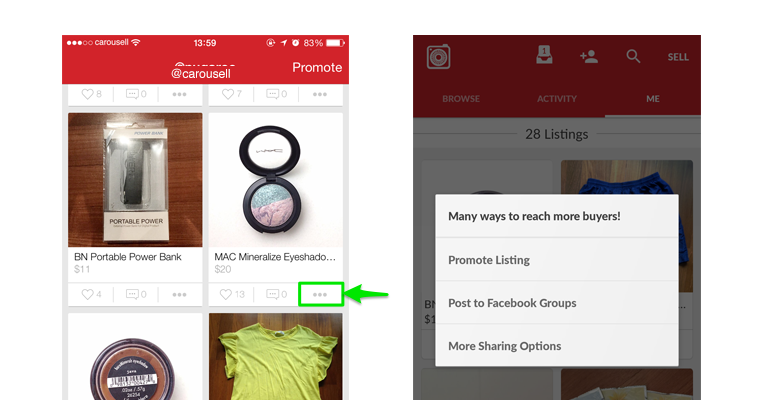 Now that you’ve played around with Carousell a little, here are some other things you can do to get more acquainted with the marketplace and the Carousell community. Follow us on our social networks to get updates, shopping tips and participate in fun giveaways! Join our mailing list to get first dibs on exciting events. If you ever need help, be sure to checking out our growing FAQ knowledge base for answers to your burning questions. Feel free to send an email to our friendly support team if you can’t seem to find what you’re looking for. Thanks for joining the Carousell community. Have fun and happy Carouselling!